The Maharashtra Government finally repealed the Urban Land Ceiling Regulations Act (ULCRA) yesterday. Some of my quick thoughts on the impact of this move. - Not a definitive answer to the housing problem for Mumbai; although the Government has said that acquired land will be given to MHADA and MMRDA for low-cost housing, chances are owners will go to court on this. Besides Government sponsored housing schemes are prone to misuse as well as lack of transparency. Update: Various newspapers are giving different numbers for the exact quantum of land released with the ULCRA repeal. Today's DNA, seems to make sense, so here's a summary. Is ULCRA repeal in Mumbai relevant? As the Winter Session of the State’s Legislature gets underway in Nagpur, newsflow on the repeal of the Urban Land Ceiling Regulation Act (ULCRA) has picked up again. Today’s DNA reports that the ULCRA might be repealed today itself. Remember, the Act needs to be repealed to get funds under the Centre’s JNNURM. While similar newsflow was active even least year during the Winter Session, nothing happened for a year. The ULCRA repeal escaped the Budget Session (March 2007) and the Monsoon Session (July 2007). Now, with the winter session underway, we’re all talking about it again. So, will it or won’t it? "It is true that the discussion on the issue has remained inconclusive during last two session, but the business advisory committee has decided to take it up again on November 21," said Deshmukh while addressing the media at his official residence Ramgiri on Sunday. Deshmukh further added that bills were always placed before both Houses of the legislature with the intention of passing them, but it would be breach of privilege if he announced that the same would certainly be passed. BJP: In favour of repealing, simply because it was their Government at the centre which formed the JNNURM in the first place, calling for reforms such as repeal of archaic and pointless laws like the ULCRA. Shiv Sena+Left+smaller parties: Against repeal, on the grounds that the Government must, instead, implement the Act, acquire surplus land and use it for affordable housing in Mumbai. Newspaper reports indicate the Sena, led by Opposition Leader Ramdas Kadam, wants loan waivers to the Vidarbha farmers as a quid pro quo for them to agree to the ULCRA repeal. Per this HT article, the total surplus land across Western and Central Suburbs in Mumbai is estimated at 3,600acres. To put things in perspective, the size of the Mumbai Mill Lands was estimated at about 600 acres (or 400acres per the SC verdict, 7-Mar-06, page 71). Conventional thinking would suggest that increased supply of land would bring prices down? Before you say yes, consider this. There is no demand-supply concept in Mumbai ‘s real-estate market. As long as builders control the supply of land in Mumbai, they will dictate prices. Thanks to the overall economy's blistering growth, demand for Mumbai’s property remains high. And with supply being completely constrained, property prices will, in all likelihood, only increase. Don’t believe me? Consider these two cases, one each in commercial and residential property, both spanning the last 2-3 years. (a) In July-2005, IndiaBulls purchased 8acres of Elphinstone Mills Land for Rs441crores, a deal termed ridiculously expensive at that time. But, aided by a generous FSI allotment on that land, IndiaBulls has converted that 8acres into prime commercial property. In the process, they’ve probably more than made up their purchase price and, if their stock price in these last two years is any indicator, will also land up making a killing on the transaction. (b) Suburban Mumbai has seen it's traditional ground+2 storied structures being converted to 10floor+ structures, thanks to the TDR policy (which allows builders to increase FSI on older buildings, if they surrender land for public use to the Government). Despite the huge supply that has come into the market thanks to this transformation, property prices have only increased. So if conventional thinking goes that repealing the Act will unleash loads of land into the market thereby bringing property prices down, nothing could be further from the truth. My own guess is that once builders eventually get their hands on this prime Mumbai property, they will convert them into villas and such-like for the super-rich. What’s left will be used for commercial development. Best case, some itsy-bitsy bits of land might be handed over to the Government as a compromise to end the litigation. That way, the Government might even come out looking good, claiming that it will hand over these lands for “affordable housing” to the public. And if you believe that, you’ll believe anything. Update: ULCRA was in fact finally repealed, more here. Once again this blog is hit by events mostly beyond the blogger's control. For more go to the other blog. I will be back soon. Till then, do visit HT's excellent Mumbai Project. Just for the whole lot of information and data, it's a must-visit. While it's good that they're running it on their website, I don't know why they're not carrying their daily pieces. ..because it promises to be far warmer than 2007, not just because or rising temperatures, but because of falling electricity supply. 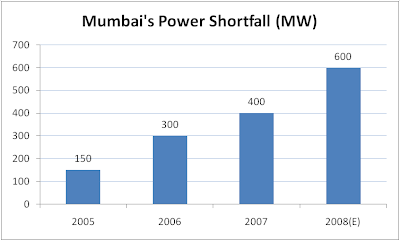 Mumbai's boast of 24x7 power was severely put to the test earlier this year. We managed by borrowing from other states and biding those sweltering summer months (and it gets progressively hotter doesn't it?). Come next summer and get ready for begging and borrowing again. Have a look at the chart below. (Source: Link. Download as excel file: Link). Yet again, the city will find itself in a bind because there are no new sources of power considering that all three power suppliers (Reliance, BEST and Tata Power) will be increasing output in the next one year. Leave alone development, here we're talking basic amenities in our city. Wonder if the ministers should start praying from now on itself. That Dharavi’s make-over will change Mumbai’s landscape is fairly obvious. Nearly as obvious as the fact that the execution of the scheme will be a huge challenge. Relocating people and relocating businesses is going to be much more difficult than getting a bulldozer and razing a few huts and shanties. And we’ve made a great start. We have no idea how many people stay at Dharavi. That’s right, the redevelopment plan of Asia’s largest slum, till some time back, was being done without any idea of how many people staying there, save for a vague number of 57,000 families (do a google search here to see how widely quoted this arbit number is). No surveys done, no approval from the slum residents required. The only voice we hear is that of builders and politicians, both of whom are already talking bids, designs, houses, commercial complexes, artists renditions, etc. Thankfully, with the appointment of Dr. T. Chandrashekhar (Ex MMRDA chief) as Officer on Special Duty, there’s at least some move towards transparency. Take, for example, his first move – to do an extensive biometric survey to establish how many people actually live there. The survey itself has run into a controversy, but let’s leave that there. A few days back, in an HT op-ed piece, noted urban planner Shirish B. Patel wrote a brilliant piece (link here, but since its an e-paper link, it will probably vanish in some time) which raised pertinent questions on the project, citing earlier slum rehab schemes in Mumbai and Delhi which didn’t work out right. For example: 55 years back, pavement dwellers from Matunga and Sion were relocated to Janata Colony, Chembur. Over time (by the 1970s) the colony grew large, but it also became surrounded on three sides by the Atomic Energy Commission, which wanted them out. In the monsoons of 1976, the colony was bulldozed and the people relocated to Cheetah Camp where the monsoons drove water to just under their beds. They live there even today, and Cheetah Camp, like Janata Colony is thriving with activity. Mr. Patel recalls the Shiv Sena which finally gave slum-dwellers their due. Which reminds me of the fruity logic thrown by some people. Logic which goes “Slums are illegal, therefore all slums should be demolished”, or the really kooky one which goes “Slum dwellers don’t contribute to Mumbai’s economy” (Read the article for why those arguments are incorrect). But I digress. The Shiv Sena formulated the Slum Rehab Scheme, recognizing the legitimacy of slum-dwellers. The Scheme, simply put, provided for free, new housing for slum-dwellers at their existing location. The extra land would be built open by builders, fetching exponentially higher revenues and thereby financing the re-housing of the slum-dwellers. The brilliance of the scheme probably lay in its simplicity. The slum-dwellers are happy (they put their new homes on rent and build a slum elsewhere to profit similarly), the builders are happy (loads of money), the politicians are happy (solid vote-bank built). Now, just to clarify, its not that I’m saying that this was the incorrect way of doing things (I wish I knew the correct way), but this scheme has been known to be a failure and to have been plagued by corruption. So, if everyone living in Dharavi is resettled there, where is the space for newcomers? How will anyone move around, whether he is a newcomer or an old resident?. Besides all this, there is also the issue of the slum-dwellers themselves. Now that their say doesn’t count (remember that the rule of 70% consent for the project, has been done away for Dharavi), what’s stopping them from going to courts? Or for any political vested interest to take advantage? The issue is not one of whether the re-development should be done or not. The issue is not that opposition to the project implies opposition to development. The issue is who do you trust? What gives you any assurance that post redevelopment, the very problems we're seeking to resolve don't come back to haunt us? It's about execution. About building confidence, perhaps even a consensus, that this scheme, and/or any modification, has a sure shot of working, rather than be soaked in doubt. But, the only people who are optimistic that the Dharavi Re-development Plan will transform Mumbai are the builders and the politicians. I’m thinking Mill Land redux. So, redevelopment, land-grab, make-over, pick your term and lets see where this goes.